Effortless and whimsical, this dainty BY JOHNNY is a season essential. Cutting round in the neck, with roulette straps, the dress has been cut on the bias to sit naturally on the body. The garments soft frill enhancers movement and adds further femininity to the dress. 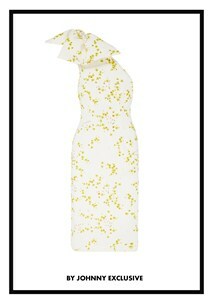 The dress is made from bubble crepe in a beautiful chill blossom floral print. It is fully lined for comfort and is a pull over style for access. PLEASE NOTE THAT THIS DRESS IS DESIGNED TO BE FITTED ACROSS THE BUST. IF YOU ARE BETWEEN SIZES WE RECOMMEND GOING UP.